The implications of EMH have extended far beyond diversification strategy. The EMH has become a short-hand for managers inside large corporations who were trained in it in business school. Whatever its merits as an investing analysis tool, it has wreaked a lot of havoc on corporate culture by glossing over the important variations over time and with place that result in growth or decay. What prescriptions does the EMH offer for managers that have been empirically validated? Not enough to justify its use as the philosophical underpinning for modern org theory. Leaders should be encourage to measure and analyze independent of the market -- an improved ethic that would enhance social well-being exponentially over long time periods. basic implication is simple and clear: it is very difficult to outperform 'the market'. Proof: retail, and professional investors on average do not outperform, instead, underperform with higher variance. The handful of repeat performers is hardly worth the cost. The agg. cost of this is large. What bothers me is that Malkiel and other EMH proponents argue that Joe Sixpack investors tend to get in and out of the market at the wrong time, so they underperform the market. If this is true, it may be the most convincing evidence against the EMH. And it's why I try to buy what everybody else is selling. If the market is hard to beat if you're fully invested all of the time, then comparing that performance with an index makes sense, apples to apples. But how does one measure timing as a strategy? You're in the market less often, but that doesn't mean you're taking less risk. Love the blog, but you definitely have an academic bias on this one. Your argument basically translates into: the average investor cannot beat the average. Of course, he can't. You need to read (or re-read) Buffett's Superinvetors speech. If all of the Orangutans come from the same zoo, you should wonder what the zookeeper is feeding them. Efficiency doesn't happen magically. It happens because smart and hard-working experts spot the efficiencies and arbitrage them away. Graham and Dodd showed their Orangutans how to find a certain class of inefficiences that existed back in the 1950's. Those inefficiencies no longer exist to any great extent and the Oranguatan from the Graham and Dodd zoo aren't doing much better than the market recently. Buffett is no longer a superinvestor so much as a super manager of a conglomerate. 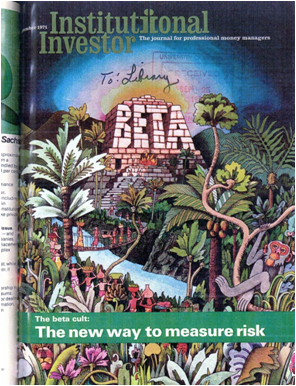 The bulk of BRK's recent profits comes from Buffett's shrewd instincts with regard to the insurance business. There are still inefficiencies in the market, big ones, but no longer many of the Graham and Dodd variety. The big inefficiency now is absolute valuation, when can be exploited via adroit market timing. This inefficiency is likely to persist indefinitely, because exploiting it requires remaining in cash and thus underperforming for years at a time, which only individuals can do. Professionals tend to be fired for underperformance when they attempt tactical asset allocation.